The Massif de la Chartreuse is located in South-Eastern France between the city of Grenoble in the south and the Lac du Bourget, between Chambéry and Aix-les-Bains, to the north. The eastern edge of the range is delimited by the River Isère. To the south, between Grenoble and Voiron, the river flows through a gap which marks the southern limit of the massif. The Chartreuse has more than 1300km of marked footpaths, ranging from gentle strolls to the long-distance paths of the Tour de Chartreuse and the Traverse de la Chartreuse. The Chartreuse saves its secrets for those who want to distance themselves from the madding crowd. Along the way you’ll find silence, time for contemplation, moments for reflection plus a healthy breath of pure, fresh air. 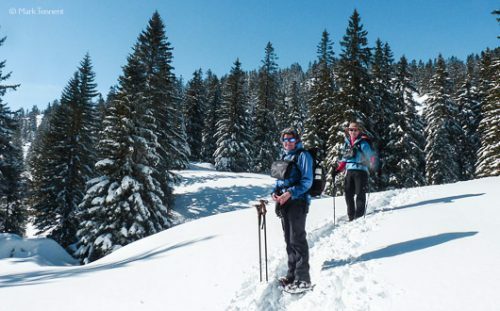 Deep snow in the Chartreuse is no problem with snowshoes. A pause to take in the scenery. 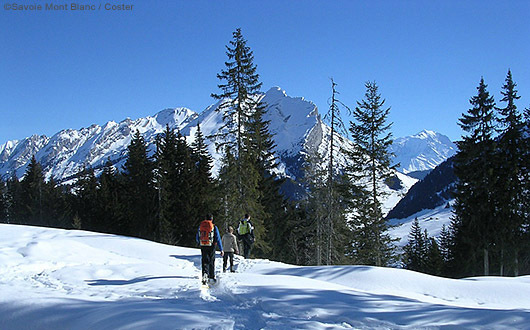 The Chartreuse was classed as a Natural Regional Park in 1995 and covers an area of 76,700 hectares, overlapping the departments of Isère and Savoie. The highest point is the summit of the Chamechaud (2082m). 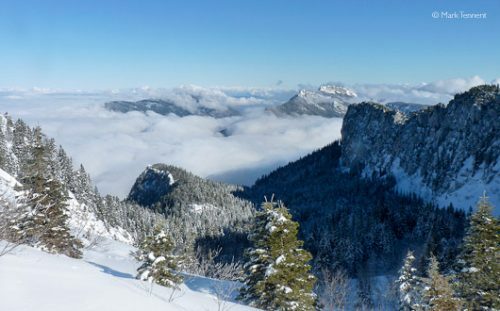 “Les Hauts de Chartreuse” (the “High Chartreuse”) are characterised by cliff-fringed mountains whose lower slopes are covered by extensive forests. They are home to roe deer, red deer, wild boar, mouflons and chamois. Ibex were re-introduced in 2010, and at the time of writing there are around 30 individuals, mainly in the Le Granier area. Above all it is a nature reserve, with restrictions in place to protect the flora, fauna and natural environment. The Chartreuse is a predominantly limestone massif which forms part of the French Prealps. During the formation of the Alps, starting around 30 million years ago, the rocky layers were folded and raised up. Erosion left only the bottom of the fold, in the form of a long gutter (perched syncline), oriented North-South. The Chartreuse is characterised by steep limestone cliffs, high plateaux and deep, wooded valleys. The massif is also something of a ‘gruyère’ with extensive cave systems; over 250km have so far been discovered. In 1988 the bones of cave bears (Ursus Spelaeus) were discovered in a cave at la Balme-à-Collomb, part of Le Granier. The Chartreuse is world-famous for the liqueur of the same name originally produced by the Monastery of the Grande Chartreuse. The monks are from the Carthusian Order which was founded by St Bruno in 1084. The ‘green’ Chartreuse is strong – 55% – and is composed of alcohol, sugar and a close-guarded secret combination of 130 plant and flower extracts! It is typically drunk as a ‘digestif’. In 2014 this liqueur will have celebrated 250 years of existence. It’s not possible to visit the monastery itself, but at La Correrie, at the entrance to the valley, there’s a museum open to the public. Monastery of the Grande Chartreuse. The traverse is probably best done South – North, leaving a vehicle in Chambéry (the start can be reached easily from Grenoble by taxi). The longest day’s walking is around 7 hours, with other stages typically being in the 5 – 6 hour range. The itinerary described gives six days of walking. 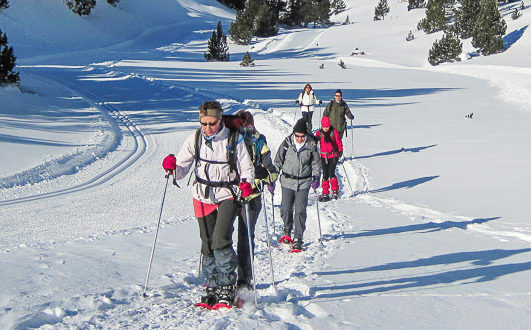 Leaving from Sarcenas, walking through snow-covered fields, allows you to take a path which leads up through forest to a ridge running between La Pinea and Montfromage (1662m). A loop back down brings you to the Col de Porte (1326m), and the possibility of overnight accommodation in the shadow of the Chamechaud. 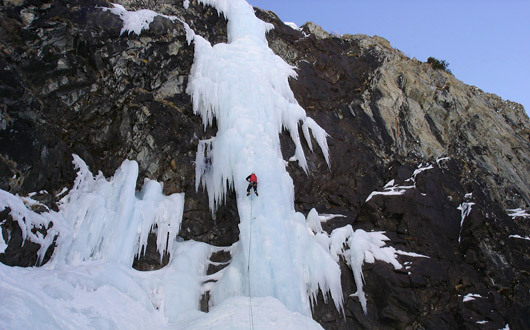 In the winter the high plateau is relatively inaccessible, and the lack of refuges or other accommodation means having to descend to the villages and hamlets. In addition the karst limestone hides deep clefts and pot holes which can be a serious hazard when hidden by the snow. The traverse thus goes from village to village, crossing passes with the possibility of taking in a few of the more accessible summits. 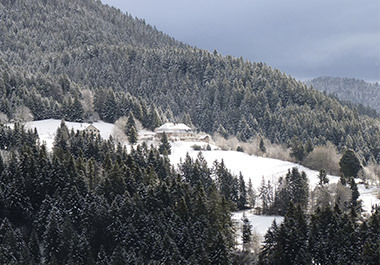 Distant view of the Auberge de Sarcenas in a mountainside forest clearing. 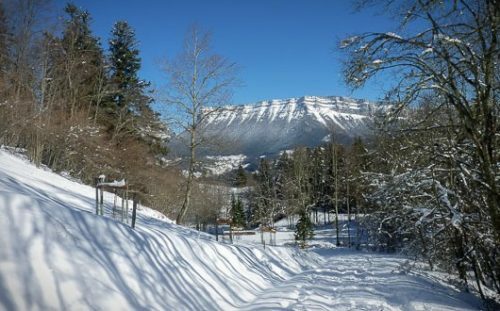 Snow-covered path among trees, with views of the Massif de la Chartreuse. From the Col de Porte a small road, closed in winter by snow, leads gently but steadily up to the alpine pastures below the Charmant Som (1867 m). Arriving at the pastures gives extensive views of the Chartreuse. 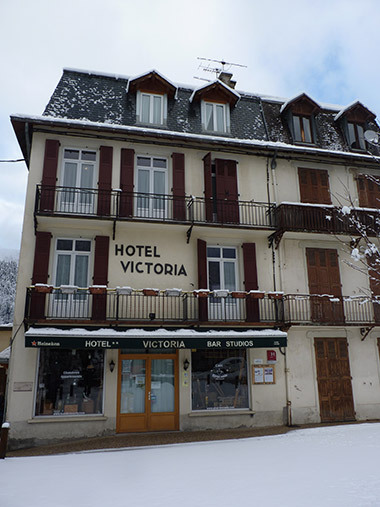 A small oratoire welcomes you to this point, while a broad ridge leads to the Chalets de Charmant Som. The way now steepens up a spur which leads eventually to the summit of the Charmant Som, one of the stunning viewpoints of the onward journey. In summer the GR path makes a descending traverse across the eastern face of the mountain but in winter this is not advised, the route crossing steep limestone slabs. The best option is to retrace your steps and to follow the approximate line of a summer path which begins near the Oratoire. Alternatively, by descending the line of the route to the Col de Porte, a broad gully clear of trees can be used to link up with the former path and the hamlet of Les Cottaves. Here contouring through fields brings you to Les Revols, where the path continues through pine woods. A final track leads down among occasional dwellings to Le Diat. 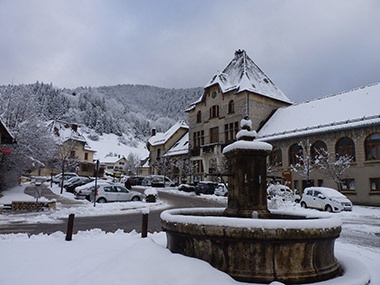 From here a short walk leads to the centre of Saint Pierre de Chartreuse, with a range of shops and choice of accommodation. The ‘green’ Chartreuse is strong – 55% – and is composed of alcohol, sugar and a close-guarded secret combination of 130 plant and flower extracts! It is typically drunk as a ‘digestif’. In 2014 this liqueur will have celebrated 250 years of existence. 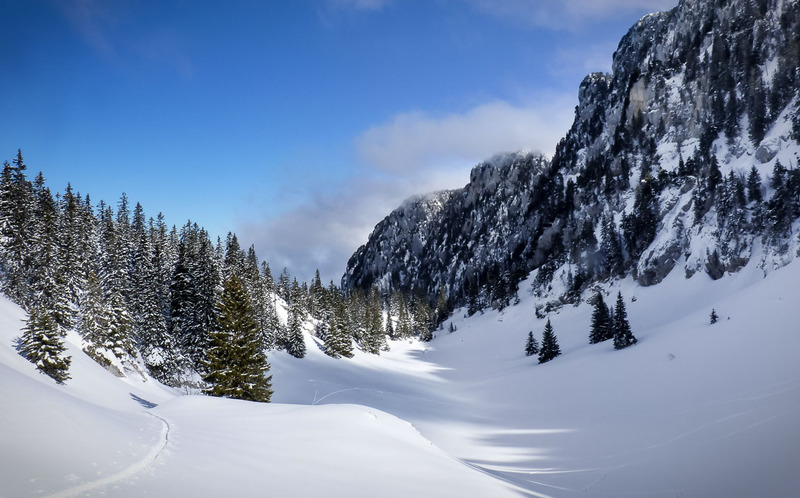 Snow-covered valley beside forest in the Massif de la Chartreuse, French Alps. A brief walk along the side of the Guiers Mort river allows one to gain a path which leads directly to La Correrie, which has a museum related to the monastery (see information panel). A tree-lined road flanked by open fields now leads to the imposing monastery of the Grande Chartreuse. The way ahead provides an opportunity to reach the Col de la Ruchère (1407m). Above you is the Petit Som and behind, the Grand Som. 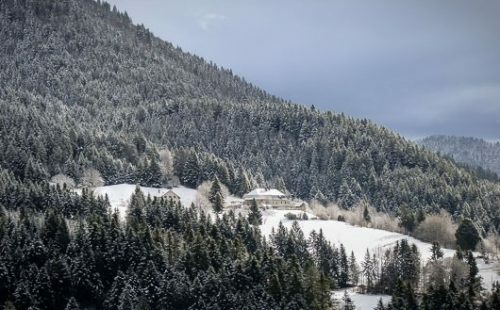 The onward path descends through mixed woodland to the hamlet of La Ruchère, which possesses a small nordic skiing area. Accommodation is available in this dispersed hamlet. Leaving La Ruchère, a break in the trees leads to a track which follows a weakness in the barring cliffs, giving access to a ‘hidden’ valley where a gentle climb brings you out on to the Col de Lechaud (1704m). The Petit Som is to the right and the Grand Som to the left. A short rising traverse allows you to pass through a cleft in the small ridge, which brings access to open slopes with sparse pines, to bring you to the Col Bovinant (1646m). A long valley flanked on the right by imposing limestone cliffs wends its way down through woods to reach the hamlet of Le Château, where an ancient ruined chateau stands guard over the village of St Pierre d’Entremont. A peculiarity of this village is that it is in fact split into two – one Saint Pierre d’Entremont is in Savoie, while the other lies in Isère. You’ll find range of services available. Early morning views over the Massif de la Chartreuse. A path leads from the centre of the village, first crossing the river then climbing through a number of small hamlets. The route now contours through fields below the forested slopes of the imposing ramparts of Le Pinet (1867m) which guard the high plateau above. Finally, to reach the cirque de la Plagne, an unmarked path through the trees leads to a forestry track. 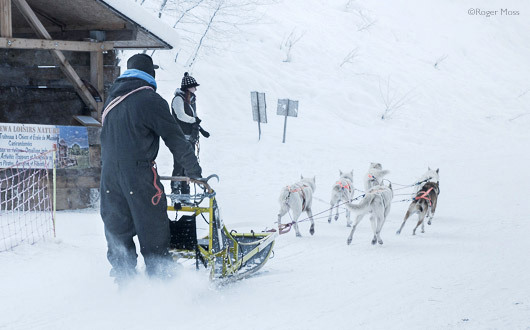 Soon you’ll arrive at the little hamlet of La Plagne, hemmed in by the cliffs above. If you look carefully on the steep slopes below them, you might see ibex or chamois. La Plagne is a starting point to gain the high plateau via the Col de l’Alpette. When quitting La Plagne it’s possible to contour around to join the small hamlet of Tencovaz after having passed above Le Granier. The onward journey crosses the road which leads to the Col de Granier, before passing through the hamlet of La Coche. Now a stream is crossed, before a climb through woods and open fields to the Granges de Joigny. Soon the path continues up through beechwoods to the Pointe de Gorgeat (1486m). Here a view opens out over Chambéry, and beyond to the Lac du Bourget, France’s largest natural lake, flanked on the left by the ridge of L’Epine and the Dent du Chat. 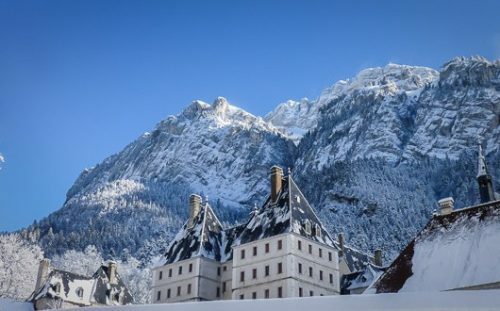 Chambéry beckons! Continue down along the crest of the ridge before leaving it at the Passage de la Coche, to join fields and eventually the outskirts of Chambéry, near a museum dedicated to Jean-Jacques Rousseau. A flight of steps leads down to the Carre Curial (a Napoleonic barracks) and the Maison des Parcs et de la Montagne. There’s a sense of satisfaction tinged with sadness after having spent the last few days among the timeless beauty of the mountains – the traverse is complete. Snowshoes and walking poles (with snow baskets) of course. 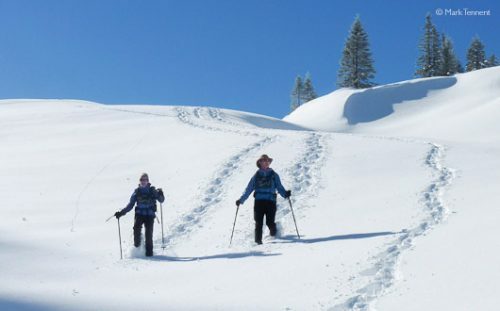 Given the nature of some parts of the traverse serious consideration should be given to wearing avalanche transceivers and carrying a snow shovel and avalanche probes. Don't forget to practise using them! In winter there are no guardianed refuges on the high plateau. One is therefore obliged to find accommodation in the hamlets and villages of the massif. Book in advance to avoid potential difficulties. 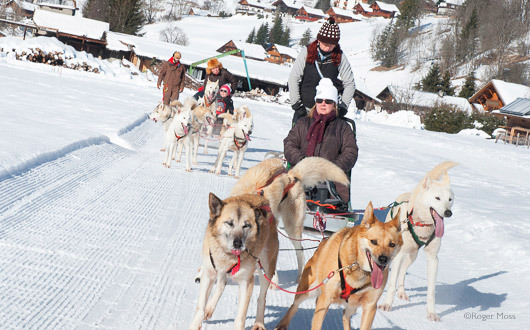 Jet2.com offers low cost flights to the French Alps from 9 UK airports. The high speed TGV from Paris goes direct to Chambéry Savoie Mont Blanc (only 2hrs 30mins) or Grenoble.